Opening hours: Most businesses open at about 8-9am and close between 6-8pm. Restaurants open later, closer to 11am, and often close in the afternoon for a few hours, before opening again for dinner. Bars, cafes and restaurants stay open late, usually until 2-3am. Many establishments close on Friday or Saturday or work only half the day. Bahrain's long and rich history has left its mark wherever one looks on the island. 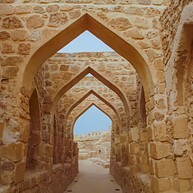 The Bahrain Fort speaks to its colonial past, while the Dilmun Burial Grounds give us a glimpse of prehistoric times, and the Oil Museum is a testament to recent development. The stunning National Museum is world-class, the National Theatre gathers artists from around the globe. All this and more will keep the curious visitor busy and fascinated for days. Housed in a breathtaking and impressive building that seems to float effortlessly on calm waters, Bahrain's National Museum is the country's most visited attraction, and for good reason. It provides a thorough and fascinating tour through the archeological, artistic and cultural history of the country, with its numerous exhibits housed in nine halls, including one for traditional handicrafts, one for documents and manuscripts, and even one for burial mounds. Just outside of Manama lies this imposing, centuries-old fort, originally built by the Portuguese in order to defend their outposts in the Gulf. The site has been in use for almost 5,000 years, and the archeological digs around the fort showcase the rich history of the area, including ruins of two earlier forts. 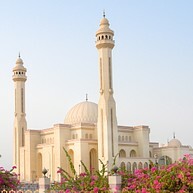 Bahrain's largest mosque, and one of the largest in the world, is a sight to behold. Covered by the world's largest fiberglass dome, its materials were brought from all over the world and processed by local craftspeople. It can accommodate 7,000 worshipers, and visitors have been endlessly fascinated by the beautiful calligraphy ornamenting the walls. 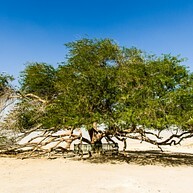 Some believe that Bahrain was the location of the Garden of Eden, and that this majestic tree is all that is left of it. At over 400 years old, this solitary mesquite tree has survived in the desert for centuries, and it believed to be the site where ancient cults practiced worshiping rituals. Another astonishingly impressive architectural achievement, the National Theatre is the third largest theatres in the Arab world, after the Cairo and Muscat opera houses. It hosts performances by some of the foremost artists in the world, ranging from classical music and ballet to contemporary shows. Like the nearby National Museum, it seems to float on the water, and interestingly, it has exactly 1,001 seats. This burial site complex is believed to be the largest prehistoric cemetery in the world, encompassing thousands of burial mounds spread throughout the island's northern area. Dating as far back as the Dilmun era (3rd to 1st millennium BC), some of the tombs are incredibly well preserved, particularly those around the village of A'Ali. 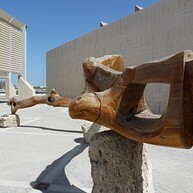 Bahrain owes much of its wealth to the oil reserves present on the island, and this museum, housed in an impressive white building at the site where oil was first discovered, provides insights into the oil industry in Bahrain through interesting exhibits and photographs. The country's first, rather primitive oil well, dating from 1932, can also be admired. 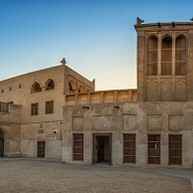 This breathtaking building was once the seat of power for the ruling Sheikh, and it is one of the finest and best-preserved traditional Gulf buildings found anywhere. A marvel of architecture, the rooms are kept quite cool in the summer heat through an inventive system of draft towers. Though unfurnished, the meticulous decoration in the different rooms deserves hours of examining.